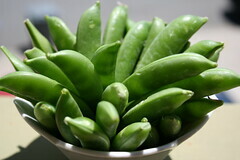 Today's raw, vegan, and absolutely delicious study snack: Sugar Snap Peas. They're sweet, crunchy, healthy, and they don't get crumbs or greasy fingerprints on my keyboard. Dare I say they may be the world's perfect study snack? K ... back to studying.